It was a busy day for Nintendo, starting with Pokemon and ending with Super Mario Odyssey. Shacknews is here with the full recap. Nintendo came locked and loaded for its Nintendo Direct presentation, bringing a slew of upcoming games for both the Nintendo Switch and Nintendo 3DS. There were some surprises, some additional details on existing games, and a whole lot of Mario. For those that missed today's presentation, Shacknews is here to recap the whole thing. Let's get started. Today's Direct kicked off with new details on Pokemon Ultra Sun and Ultra Moon. The crux of the game is that Necrozma has split into two different versions: Dusk and Dawn. Players will journey across Alola once more, while also discovering all-new areas, including a surfer beach and the Valley of the Pikachus. Players will also find a different encounter with their partner Pokemon, as well as new customization options. New Ultra Beasts will also lurk across the land, with UB Burst and UB Assembly confirmed. There are several incentives tied to getting Pokemon Ultra Sun and Ultra Moon early. Purchasing the game before January 10 will grant players a special Rockruff that can evolve into Dusk Form Lycanroc. Getting the digital version of the game prior to that same date will also give users 12 free Quick Balls. For those more into classic Pokemon, the original Pokemon Gold and Silver will hit the Nintendo 3DS Virtual Console on September 22. Those that purchase either of these games will be able to score legendary Pokemon Celebi for either the first Sun and Moon or Ultra Sun and Ultra Moon. The first of the Mario & Luigi games is getting ready to hit Nintendo 3DS. Mario & Luigi: Superstar Saga is the Game Boy Advance classic just as players remember it. And as revealed at E3 2017, a special "Rosencrantz and Guildenstern are Dead" type of side story featuring Bowser's minions is also being included. New details include a special Stamp Sheet item that players can punch by using compatible Amiibo figures. 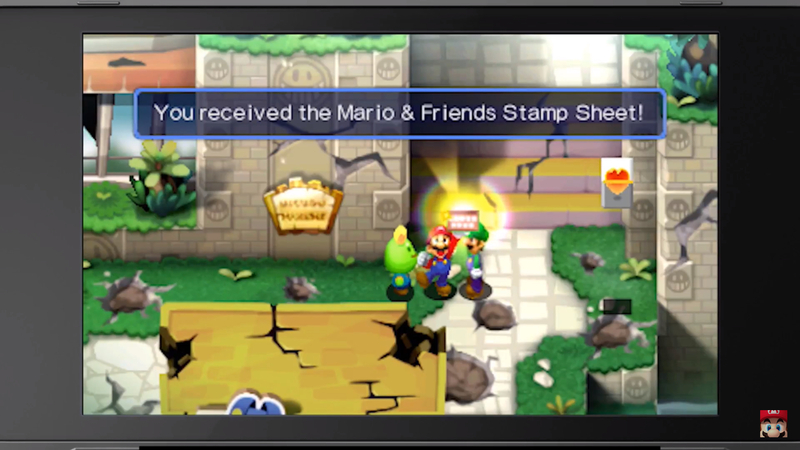 More stamps means more equipment and items across both the main story and the Bowser's Minions story. The game is set to release on October 6, along with the new Goomba and Koopa Troopa Amiibo figures. Kirby got a double dose of news, starting with Kirby's Battle Royale on Nintendo 3DS. The game will feature a last-man-standing Battle Arena mode, as well as a Hoard Express mode where the winner is the the fastest Kirby that can hoard the most treasure. Single-player Story Mode and online battles will also be available. Kirby Battle Royale is set to release on January 19. The Nintendo Switch is also getting a Kirby game, with the game first revealed at E3 2017 getting an official title. Going by the name Kirby Star Allies, the game will see Kirby recruiting foes by tossing hearts at them, creating a party of up to four characters. Kirby will get various team-up attacks, depending on the enemy he recruits to his side. These attacks will be further varied and powered-up depending on Kirby's copy abilities and elemental boosts. All of these enemies can also be controlled by human players, offering up four-player cooperative play. Kirby will need all the help he can get, as a mysterious dark force has fallen over Dream Land. 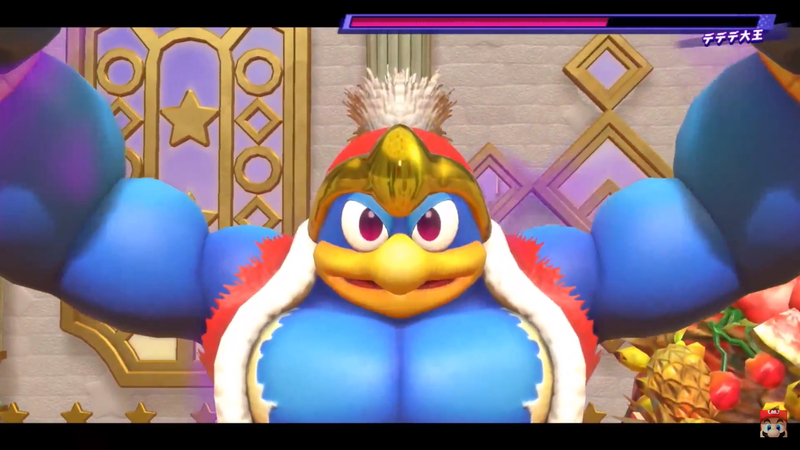 This has turned the evil forces more evil and it's turned King Dedede... well... it's apparently given King Dedede the Jon Jones diet. Look at him flex! Kirby Star Allies is set to hit Nintendo Switch in Spring 2018. 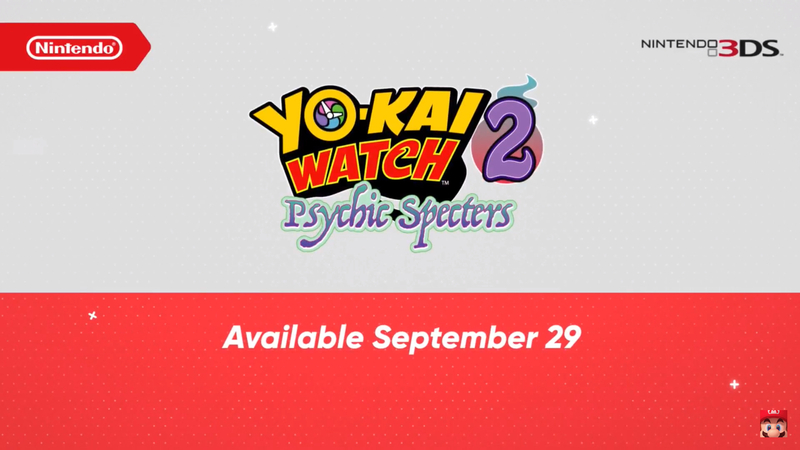 Yo-Kai Watch 2 has seemingly come and gone, but Nintendo has a special definitive version of the game ready to go in the form of Yo-Kai Watch 2: Psychic Specters. This version of the game promises new content and additional features, though Nintendo did not specify. For those that already own Yo-Kai Watch 2: Bony Spirits or Yo-Kai Watch 2: Fleshy Souls, a special Oni Evolution update will be made available on Thursday, September 14. This opens up new features, including the ability to befriend Jibanyan S and take on whole new boss battles. It'll also allow for those users to take their sava data along with them to Yo-Kai Watch 2: Psychic Specters. Yo-Kai Watch 2: Psychic Specters hits Nintendo 3DS on Septmber 29. While iOS and Android users have had their chance to solve mysteries with Layton's Mystery Journey: Katrielle and the Millionaires' Conspiracy, Nintendo 3DS users are still waiting for their chance at the latest in the Layton puzzle series. Nintendo 3DS users will get an exclusive outfit, but more importantly, will get their chance to pick up Layton's Mystery Journey: Katrielle and the Millionaires' Conspiracy on October 6. Minecraft is finally coming to the 3DS family of systems. However, it appears to only be the New Nintendo 3DS line, so those with older models look to be out of luck. 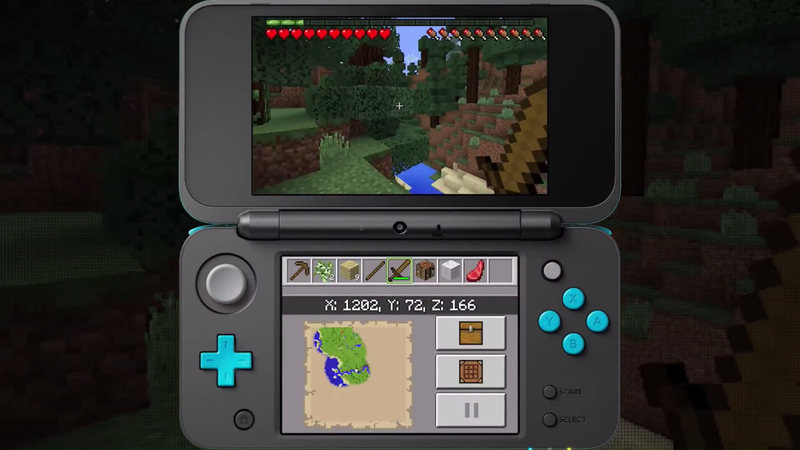 Minecraft: New Nintendo 3DS Edition takes advantage of some key 3DS features, mainly the touchscreen to help manage the player's inventory. The game will come with five skin packs and two texture packs as a bonus. However, there's currently no word on whether the 3DS version will be able to play with the other versionf of Minecraft, the way the Nintendo Switch version can. Given Mojang and Microsoft's desire to reach out to other platforms, this is likely only a matter of time. Minecraft New Nintendo 3DS Edition is out right now as a digital download, with a retail version set to hit later. The Mario Party series has been around for a long time and Nintendo knows it. So it's time for a special compilation. Mario Party: The Top 100 collects 100 of the best minigames from the main series, from the original Mario Party on the Nintendo 64 through Mario Party 10 on the Wii U. Download play will allow for up to four players to play on a single cartridge, though it's curious to see a concept like Mario Party going to the handheld 3DS before hitting the new hotness of the Nintendo Switch. Regardless, Mario Party: The Top 100 hits Nintendo 3DS on November 10. The Alliance Alive - A story of nine characters coming together to combat evil and save their kingdom. Set to release in Early 2018. Shin Megami Tensei: Strange Journey Redux - The original game brought to the 3DS with enhanced graphics and new features. No release date was given for this one. Radiant Historia: Perfect Chronology - This is an expanded port of the 2011 game originally released on the Nintendo DS. In addition to revamped art, new voiceovers and animation, and new content, 3DS owners can look forward to a special launch edition featuring decals and art. Etrian Odyssey V: Beyond the Myth - The latest in the Etrian Odyssey series. Players can get an idea of what this game features right now, because the demo has just hit the 3DS eShop. It feels like ages ago since Phoenix Wright first crept up on unsuspecting handheld players and became a huge cult hit. Six games later, it's time to revisit the series' early days, as fans get a chance to relive Apollo Justice: Ace Attorney. The game is set to hit in November. Meanwhile, Fire Emblem is ready to get the full Dynasty Warriors treatment. Fire Emblem Warriors allows players to take on enemy soldiers by the hundreds, as it's set to release on October 20. The Nintendo Switch version of Fire Emblem Warriors is getting a new character in the form of Lyn, coming in from the Game Boy Advance Fire Emblem. Like the 3DS version, the Switch version of Fire Emblem Warriors will also hit on October 20, alongside a special edition and Chrom and Tiki Amiibo figures. Finally, on the 3DS front, a new version of the New Nintendo 2DS XL was unveiled. This one comes in orange and white, which basically makes it look like a 2DS Creamsicle. This is set to release on October 6. For those that would rather their handheld not look like a frozen treat, the earlier Pokemon announcement also pointed to a new version of the New Nintendo 2DS XL set to coincide with the release of Pokemon Ultra Sun and Ultra Moon. This 2DS is designed to look like a Poke Ball and should catch the eye of any Pokemon maniac. It'll be out on November 3. Today's Nintendo Direct then segued over to the Nintendo Switch, starting with new information on Xenoblade Chronicles 2. An eight-minute demonstration took a look at the massive world players will get to explore. It also explored elements of the game's story and the combat that looks reminiscent of the heavily overlooked Wii U Xenoblade Chronicles, which was a dark horse Game of the Year candidate just a few years ago. Those looking to go all-in on Xenoblade CHronicles 2 can pick up the Special Edition, which will include an art book, soundtrack, and metal game case. And while new Joy-Cons have been all the buzz with recent game releases, Nintendo is taking a different route this time around and offering up a Xenoblade Chronicles 2-themed Pro Controller. Splatoon 2 is getting some new updates in the near future. The first of which is set to hit this Friday, adding the Kelp Dome map from the original Wii U game. Given that many players are discovering Splatoon for the first time on the Switch, this should be a fresh hit for those newcomers. In terms of new maps, Snapper Canal is set to hit the game soon, as will a new weapon. The Tenta Brella offers some mediocre offense, but outstanding defense, since it spreads out and shields the player from danger. One would imagine it won't work so well against Splat Rollers, but it'll still be one heck of a defensive force. Snipperclips was a sleeper hit among the Nintendo Switch launch lineup and now it's set to get some additional content. Snipperclips Plus: Cut It Out Together will add 30 new stages which will draw from some new environments, like toy boxes and comic books. Original stages will also be included, along with some remixed objectives. The Cut It Out Together update can be found as a DLC download, but the full game will also be available in stores starting November 10. Morphie's Law is an intriguing new shooter designed for the Switch and comes with an amazing twist on the shooter concept. The idea is still a team-based shooter, however, shooting any part of an enemy's body will cause that body part to shrink. Conversely, it'll cause that same part to grow on the player. Physics will adjust accordingly, as the field becomes filled with deformed characters all trying to shoot at one another. Morphie's Law, from indie developer Cosmoscope, was first revealed at PAX West and that trailer can be seen below. The game is set to arrive on the Switch this winter. While MOBAs have overwhelmed the PC gaming space and started to show up in greater numbers on PS4 and Xbox One, the Switch doesn't really have any of these types of games. That's about to change with Arena of Valor, the Switch's first MOBA. Players can pick from 35 characters and compete in standard MOBA action. Of course, given that it's from Tencent, parent company of League of Legends creators Riot Games, that standard MOBA action should definitely be solid. All of the typical MOBA roles will be in place, along with 5v5, 3v3, 1v1, and Hook Wars modes. Arena of Valor is set to get a free beta this winter. It was time to show off Bethesda's contribution to the Switch, which looked to be The Elder Scrolls V: Skyrim. Everyone already knew that, right? How about what people didn't know? How about Doom and Wolfenstein II: The New Colossus on Switch? This is a shocking announcement, particularly given the Switch console's limitations. Whether these games will be stripped down from the PS4 or Xbox One remains to be seen, but it's still really cool to see these two games hitting a Nintendo console. Unfortunately, it'll be a while before they show up. 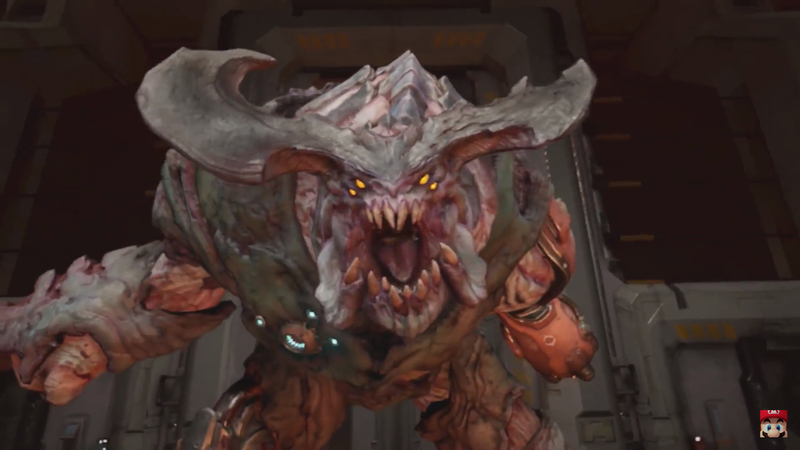 Doom is set for a holiday release, while Wolfenstein II isn't set to hit until an unspecified 2018 date. Flip Wars continues to roll on and is set to receive a new update, which will include fresh leaderboards and a new Red Coliseum stage. 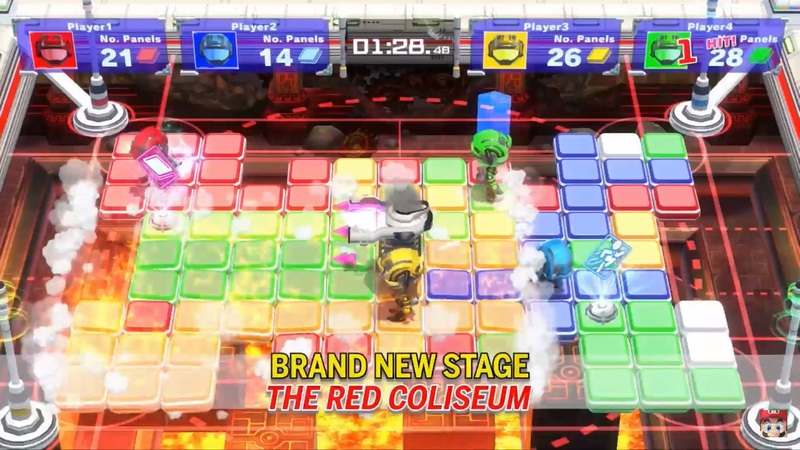 The Red Coliseum will introduce magma to the proceedings, so players will need to be careful as they flip their tiles. There's a chance those tiles will be red hot and give their character a wicked hot foot. This will go nicely with new mechanics, like spinners that flip tiles. Local wireless play is also seeing the light of day with this update, which is set to hit today. Arcade Archives introduces classic Nintendo arcade titles to the Nintendo Switch. The first of these games will be the original Mario Bros., which had Mario and Luigi knocking over Shellcreepers and crabs before they ever even heard the name "Bowser." Future Arcade Archive games will include Super Mario Bros., Balloon Fight, Ice Climbers, and more. These will hit Switch over time. As for Mario Bros., it'll hit Nintendo Switch on September 27. The Legend of Zelda: Breath of the Wild still has some more content on the way. However, today's Nintendo Direct wasn't the day to reveal those details. Instead, it was time to talk Amiibo, with the Champions figures getting a release date. Mipha, Daruk, Revali, and Urbosa will all get their Amiibo figures released on November 10. Using each of these Amiibo will unlock a special helm based on their Divine Beast, so don't be afraid to use these things with your Breath of the Wild save file. But what about Nintendo's other fighter? Yes, Arms is getting its next update with version 3.0.0. Lola Pop joins the battle, along with her unique set of arms. Players are also able to customize their controls for the first time. The Arms 3.0.0 update is out right now. Today's Nintendo Direct then moved on to a Switch-exclusive RPG from Square Enix. Touted as the next game from the team behind Bravely Default, Project Octopath Traveler (working title) follows eight different characters and all of their individual tales. The game is rendered through a combination of pixel art and CGI in a style called "HD-2D." Each character will have their own commands that allows them to interact with characters in completely different ways. This allows players to utilize completely different approaches to select situations, offering unique playthroughs. The combat will also offer an evolution on Bravely Default's system, allowing players to boost their attacks and charge them up over the course of more than one turn. For more on this game, check out the video below. A demo version is available right now on the Switch eShop, while the full version is set to arrive in 2018. The blend between Dragon Quest RPGs and Minecraft is finding its way to the Nintendo Switch. Dragon Quest Builders offers some new twists to the Dragon Quest formula, encouraging users to build massive structures while also warding off monsters. The Nintendo Switch version is getting an exclusive sabrecub that will yield additional items when it defeats foes. Dragon Quest Builders is set for a Spring 2018 release. And then there's L.A. Noire, which Nintendo has confirmed for a November 14 release. It'll be a complete edition with all of its DLC, along with new collectibles, new suits with special abilities, a Joy-Con mode, and a touchscreen mode. However, there wasn't any gameplay revealed at all, which should be a cause for concern. And finally, it's time for the main event, as today's Nintendo Direct closed with Super Mario Odyssey. There are several other kingdoms that Mario will be visiting, which Nintendo is promising to keep under wraps until the game's release. Mario will be busy looking for Power Moons, but if he gets stuck, he can talk to loud-mouthed bird Talkatoo, give coins to the Hint Toad, or utilize certain Amiibo on Uncle Amiibo. Mario's look will also be customizable through the use of the Crazy Cap store. These outfits will fit with the theme of whatever world he's in and others will tap into Mario's rich history, like his Dr. Mario outfit, his Super Mario Maker outfit, and even his chef outfit from Yoshi's Cookie. And while the game is set to hit on October 27, Nintendo isn't stopping with a standalone game release. The Mario Odyssey Amiibo figures will also hit that day, each of which will offer a specific gameplay bonus, though other Amiibo will also be usable. And finally, there's the Super Mario Odyssey Switch bundle, which is set to arrive on October 27. It'll come with the game, as well as Mario red Joy-Cons and a Mario carrying case. And that's it for today's Nintendo Direct presentation. Any news that caught your eye? Join the conversation and let us know in the comments. Do you guys have a review copy of NBA 2k18 for Switch? Really curious how that port will turn out. I'm still pissed they cheaper out on the cartridge.